November, December, January: Open sporadically, mainly on weekends. King Charles IV was a Czech king and a Roman Emperor. It was his decision to build the castle in 1348 and he took a keen interest in its construction, especially the design of the chapels. The three storey building was completed in 1355, with the consecration of the Chapel of the Holy Cross. This also coincided with the year of his coronation. 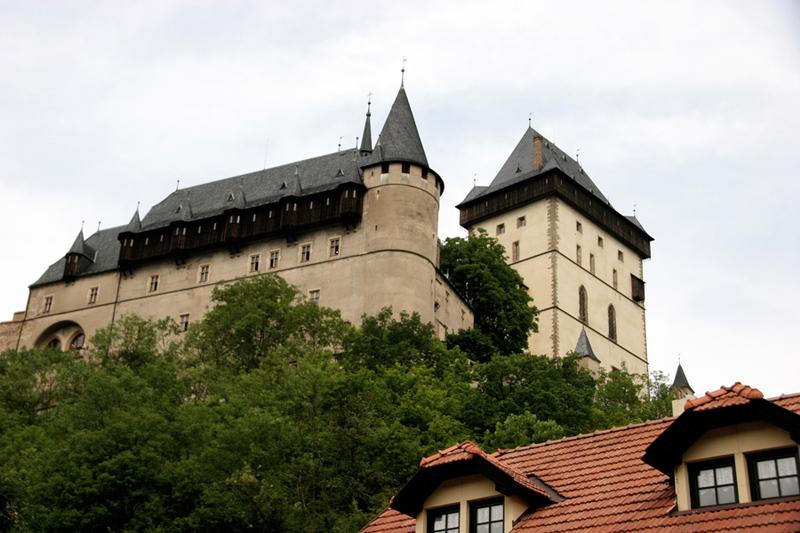 This medieval gothic castle is situated approximately 35 km south west of Prague and is built on a prominent rocky hillside, surrounded by dense forest. 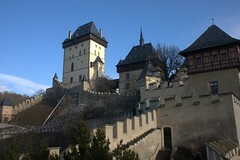 It is one of the best kept castles in the Czech Republic and the views from the top are spectacular. 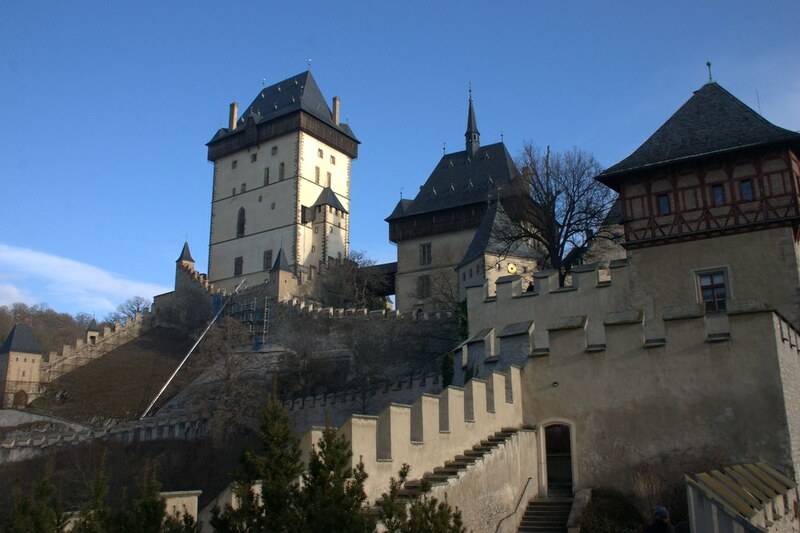 During the Hussite wars against the reformist Jan Hus of Bohemia and his followers, it was decided that the Czech Coronation Jewels, holy relics and many important state documents would be kept more securely in the castle. As with so many ancient buildings, it has undergone several major renovations and reconstructions. The Great Tower, housing the Holy Rood Chapel, was rebuilt in the 15th century, and in the late 16th century a major renovation in renaissance style architecture was added. Its current form is a product of a rebuild undertaken in the late 1800s and it was opened to the public in 1910. Charles richly decorated the original interior but the present inside is rather stark, with minimal furniture and decorations, but this helps to emphasize the beauty of the architecture. 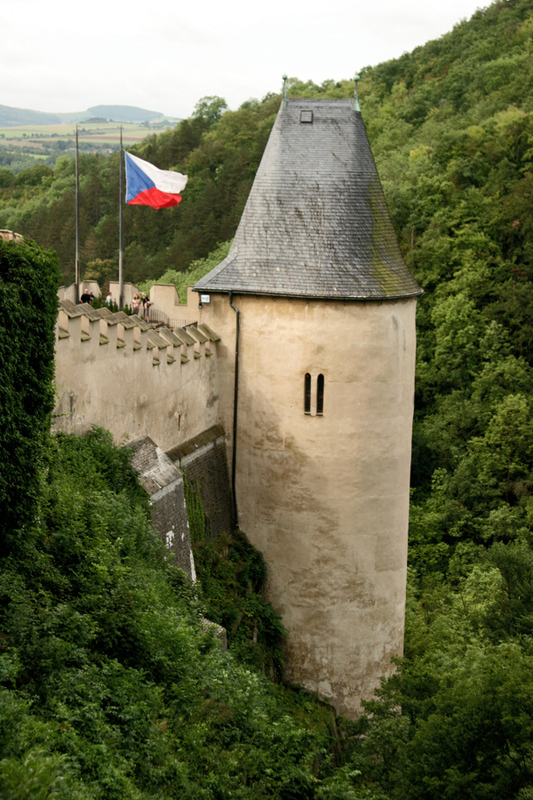 Most of the pieces are reproductions but the wall paintings are original and date back to the 14th century and it displays the largest collection of Czech rulers' portraits in the country. The Roman Empire's Crown Jewels are no longer there but there is a replica of St Wenceslas' crown, which was used by the Czech's kings during their coronation. Several guided tours are offered in different languages but these generally need to be booked in advance. There is a shop in the castle courtyard and the nearby village has several good cafes. Be the first to write a review about the Karlstein Castle ! See below for more information. Have you already visited the Karlstein Castle ? If so, let everyone know what you thought about it by writing a review! No registration necessary. Just click here to start writing! View all Karlstein Castle Pictures.